To live in Wales, or to be in any way Welsh, is to dwell in a landscape of contradictions. For example, Welsh poet and scholar Tony Conran (1931-2013) translated historical Welsh poetry into English but was allegedly unable to conduct everyday conversation in modern Welsh. R. S. Thomas (1913-2000), the Nobel-nominated Welsh poet and nationalist became fluent in Welsh in adulthood but maintained English as the only language of his poetry. Remote from colloquial Welsh discourse, Conran gave readers of English access to the poetic inheritance of Welsh. Thomas could protest and persuade in Welsh, but contributed to the nation’s poetry in English. In this way, literary identities seldom align neatly with their national analogues. Observe Britain’s other “Celtic” nation today and the “ambivalent, charged and complex” relationship between literature and nationality. It is from the literature of Wales and the earliest writings in its language that we derive the origin of an ancient and enduring contradiction which continues to trouble national and literary imaginations. The name of this contradiction is Arthur. 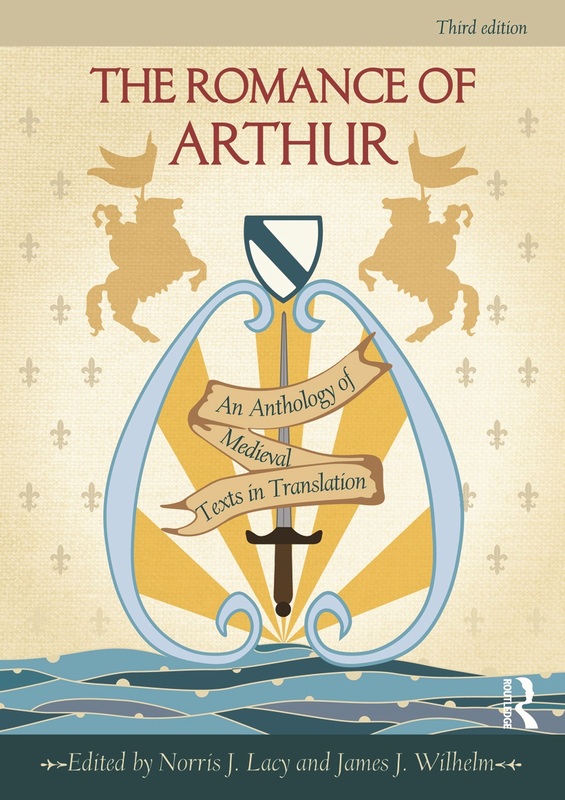 After twenty years as the standard Arthurian reader, the publication of a third edition of James J. Wilhelm’s The Romance of Arthur, co-edited by Norris J. Lacy, offers an opportunity to examine a modern readership’s encounter with original Arthurian sources. Focussing on the earliest transmission of Arthurian elements, this review concentrates on half of the anthology’s twenty-two chapters. as […] the old Greek legends, made an Iliad and an Odyssey of by Homer, furnished the poets of the great age of Greece with forms of their immortal dramas; so, I believe, will the Pre-mediaeval Celtic legends, as they have been prepared for us by the poetic romancers of the Mediaeval Age, be found to present the most varied and easily adaptable material for the European poets who will dare unreservedly to accept Science. […] the new verbal critiques go far beyond the rather timid scepticism which I had expressed occasionally. Consequently, they have largely undermined the case which I had advanced for the historic Arthur: indeed, some scholars would claim that they have destroyed that case completely. An admission of intellectual misadventure is a testament to academic discipline, a force to which many published “histories” of Arthur have never been subjected. Take for example 1999’s Arthur and the Lost Kingdoms, republished in 2012, by the Scottish broadcaster Alistair Moffat. Early in its pages, Moffat (a graduate of St Andrews, in Medieval History) politely excuses himself from all responsibility to rigour: “I care nothing for academic reputation, the conventional wisdom or the weight of opinion. These researches are founded on common sense and sufficient erudition.” This self-exemption is even more troubling when we consider how these non-fiction works of Arthuriana are marketed. Compare two recent book jackets: Moffat’s credulous Lost Kingdoms and Guy Halsall’s sceptical synthesis Worlds of Arthur (2013). Both books bear cover images of a ghostly sword-hilt floating before a murky landscape. Remarkably, The Romance of Arthur also adopts the sword motif, against a field of chivalric kitsch. Let us hope that academically-inclined readers discern history from fantasy by interrogating content. Undermining this hope is the tendency among certain academics to allow their boyhood fantasies (note: all the Arthurian fantasists pertinent to this review are male) to play freely at the cliff edge of doubt. Norman Davies, author of Europe: A History, does not miss the chance to perch his own Arthur on Dumbarton Rock in the “Alt Clud” chapter of his recent Vanished Kingdoms. Flights of pseudo-historical fancy are not benign. Attempts to affix the historical Arthur to a geographical locale are inherently personal, and certainly political. This is the intellectual climate into which The Romance of Arthur is republished. The material most relevant to the claims of Arthur-seekers is found in the first chapter of the anthology, “Arthur in the Latin Chronicles,” in which Wilhelm provides a summary of the possible point of origin of the legend of Arthur. A notable feature of the early material is the absence of Arthur in name. Sixth century British cleric Gildas gives names to other figures in his De excidio et conquestu Britanniae (On The Downfall and Conquest of Britain) but does not name Arthur. In describing the fifth century conflict he refers to one Ambrosius Aurelianus, inheritor of Roman status, leading the Britons against the Saxons. The name is first given to a British war leader by a Welshman, Nennius, in the Historia Brittonum (The History of the Britons), a text compiled three centuries after the time of Gildas or the supposed age of Arthur. The centuries lying between Gildas’ outlining of the role and the naming of the character as we know it provide the perfect plot hole to be filled. In the intervening period, the Britons who had formed the cultural majority of the island during the Roman period would gradually obtain the English designation “Welsh” and eventually appear to become a cultural minority in the history of Britain. Yet it is the Welsh sources which are the first layers of material to fill the fertile gap between Gildas and Nennius. These are drawn together by John K. Bollard in the anthology’s second chapter. in the van, an alder shield-wall – Gwawrddur. This translation, offered by John K. Bollard in the anthology, is more restrained than a popular version by A. O. H. Jarman, which interprets the phrase “ceni bei ef arthur” as “he was no Arthur”  inclining the reader further towards the comparison. No competing interpretation has been widely advanced for this line of poetry, upon which the character of a literary tradition seems to pivot. Also in the Welsh tradition, the anthologists begin to identify the names later adapted to populate Llys Arthur (Arthur’s Court). Gwalchmai will become Gawain, Bedwyr, Bedivere; Gwenhwyfar, Guinevere. Like the first occurrence of Arthur’s name, these pronouns appear next to abstract detail in list-like poems and elegies, rather than in narratives. It is tempting, though anachronistic, to imbue the first sight of a name with all its later literary connotations. It quickly becomes unclear which culture is responsible for the specific additions to the jumble of names and attributes. The Trioedd Ynys Prydain (Triads of the Island of Britain) surviving from the thirteenth century, contain reference to “Lanslod Lac,” a charming Welsh phoneticism of Chrétien de Troyes’s hero Lancelot du Lac. Here a feature has been borrowed (or borrowed-back) into the Welsh literature from a source which appropriated the tradition. […] and Ffflewdwr the Flamelord, and Rhuawn the Strong son of Dorath, and Bradwen so of Prince Moren, and Prince Moren himself, and Dalldaf son of Cimin Cof, and the son of Alun of Dyfed, and the son of Saidi, and the son of Gwryon, and Uchdryd Protector in Battle, and Cynwas Cwryfagyl, and Gwrhyr Rich-in-Cattle, and Isberyr Cat-claw, and Gallgoid Gofynynad, and Duach and Brathnach and Nerthach, sons of Gwawrddur Cyrfach – from the uplands of Hell did these men come. This is a tiny fraction of the “catalog,” a rhythmical and breathless sequence. It is possible that portions of the list were recited by alternating voices in a competitive scenario. However it was delivered, the humour is still palpable, the tale seems to satirise the same courtly and genealogical tradition it celebrates. The bulk of the tale (also known as How Culhwch Won Olwen) is also full of challenge and response. Culhwch, a nobleman (though his name means “pigsty”), applies to Arthur’s court to help him win the daughter of Ysbaddaden Chief Giant. Arthur assigns Bedwyr and Kei to the quest. Ysbaddaden charges Culhwch with forty impossible tasks to obtain certain anoethau (wonders) which are required in order to groom the giant for the wedding feast. The hero assures his foe each time: “It’s easy for me to manage that, though you think it’s not easy.” Before the giant counters: “Though you manage that, there’s something you won’t get […]” for a total of forty iterations. Mercifully, half the feats go unreported before Culhwch and company return to shave the giant: “the flesh and skin to the bone, and the two ears completely.” The giant’s last words before decapitation tell Culhwch he could not have won Olwen without Arthur’s help. Arthur therefore functions solely as the commanding officer and manager, the originator of power. In this Welsh context he occupies a defined role, but without a discernable character. In claiming to reveal the truth about a tract of obscure British history, Geoffrey of Monmouth is not at all unlike the modern pseudo-historians. Certain details suggest keen research embellished with fantasy, all delivered in the name of “history.” As the anthology notes, Geoffrey wrote for Norman patrons, conquerors of Britain mining British history for an identity. This is not the Arthur of resistance but the Arthur of empire. Geoffrey’s History gave us Shakespeare’s ancient British kings Cymbeline and Lear. It also gave us Merlin’s prophecy of the return of British rule, which helped launch Wales’s Tudor dynasty. No man was considered courtly […] who did not come and stay for a while with Arthur in equality, and who did not have the clothing, trappings, and the armor of the sort that those who served at Arthur’s court had. Even in its earliest incarnation the Round Table was as much a device of exclusion as inclusion. Indeed, foreign kings “feared and trembled that he would conquer the whole world […]” – scholars employ the term pax arthuriana with some supposed measure of irony. The wealth of material presented in the anthology carries us eventually to the familiar works Sir Gawain and the Green Knight and Malory’s Le Morte Darthur. In tracking a single theme across a rough millennium from 500 to 1500AD, the collection captures the ranging spirit of the European imagination between classical and modern worlds. How the name given to an anonymous British hero became the heading for a diversely appropriated and yet unified corpus of writing is a story worth the understanding, not least because its ancient tradition has weathered modernity. The pseudo-historical quest for “the real King Arthur” continues, adapting to the agenda of each new researcher. Meanwhile, the fictional Arthur adapts to the demands of any audience, a legend continually recast in realistic and fantastic form (with or without dragons). We can also readily witness another, more diffuse, adaptation of Arthur’s world, that disputed Late Antique north-western Europe of legend, in the physical and magical parameters of “dark age“ or “medieval-“ fantasy, from J.R.R. Tolkien to G.R.R. Martin. Our king takes his descent from Arthur. He was never really dead but waited in the forest biding his time, or possibly in a lake. He is several centuries old. Merlin is a wizard. He comes later. You will see. There are twenty-one chapters. If it keeps on raining I will read them all. Some of these things are true and some of them lies. But they are all good stories. Gregory, those Merlin stories you read – we are going to write some more. Far from the fantasy genre, we have here a realistic fiction based on history, set at the outset of modernity, in which Arthurian fantasy is used to shape the political reality. Milan Kundera writes of the modern novel (and by extension the modern era) in terms of “the depreciated legacy of Cervantes.” At the dawn of modernity, reader-adventurer Don Quixote carries medieval ideals into a landscape which has forgotten them. In the diffuse appropriation of Arthuriana, the modern fantasists reverse Don Quixote’s journey. Not as Mark Twain’s Connecticut Yankee took the nineteenth century back to the sixth to compare their relative brutalities, but much as Walter Scott (one target of Twain’s satire) composed a tale of chivalry fit for the reader-adventurer. Scott’s Ivanhoe (1820), the first medieval historical novel in English, would have charmed Don Quexana. Indulging in fantasies of the medieval, the errant reader risks the fate of the deluded knight of la Mancha, ever destined to superimpose the medieval image on the landscape of the real. To return to the learned misadventures of Lesley Alcock, the “common sense” of Alistair Moffat and the alleged hoax of John Morris; these are the twentieth century Quixotes who absorbed Arthurian fantasy and rode out in search of Camelot. The failure in their readings is to mistake this literature for treasure maps, when the literature itself is the treasure. “[…] hard to find in this world, a grave for Arthur”; words from Englynion y Beddau (The Stanzas of the Graves) from the ninth or tenth century, found in the anthology’s second chapter. Arthur is a restless entity. John Bollard translates that “troublesome” Welsh word anoeth as “a thing difficult to find or obtain; a wonder.” We wonder at Arthur’s uncertain end. As we began with Welsh contradictions, so let us conclude: perhaps never having lived, Arthur cannot truly be said to have ever died. Diffused across borders, Arthur cannot be contained in any single landscape, perhaps least of all the land which christened him, be that Britain or Wales. Arthur survives in poetry and prose, is buried in writing. That is no resting place.